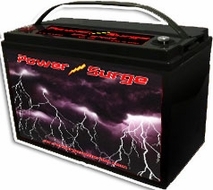 This "POWERHOUSE", is perfect for Off-vehicles, Monster Trucks, Semi Tractors and also works great for the 12 volt direct power source in your RV's, Transporters, and Race Trailers. This battery can "HANDLE" it all. This is the most used size battery in car audio "SPL" competition! Provides awesome output for starting power, large audio systems, SPL competition systems, marine, large multimedia systems and many, many more! !